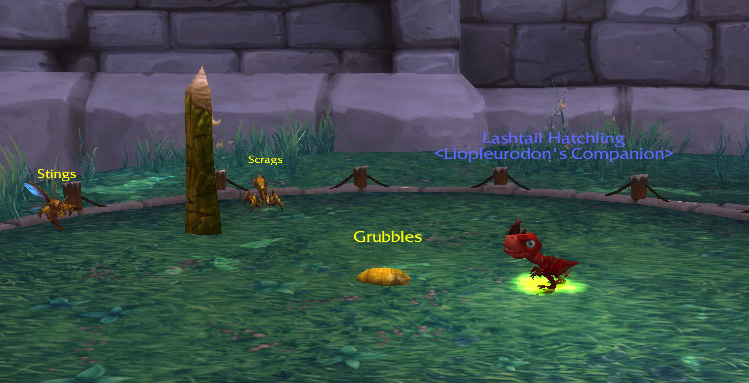 There are a lot of new pets & pet battles to encounter in Draenor. 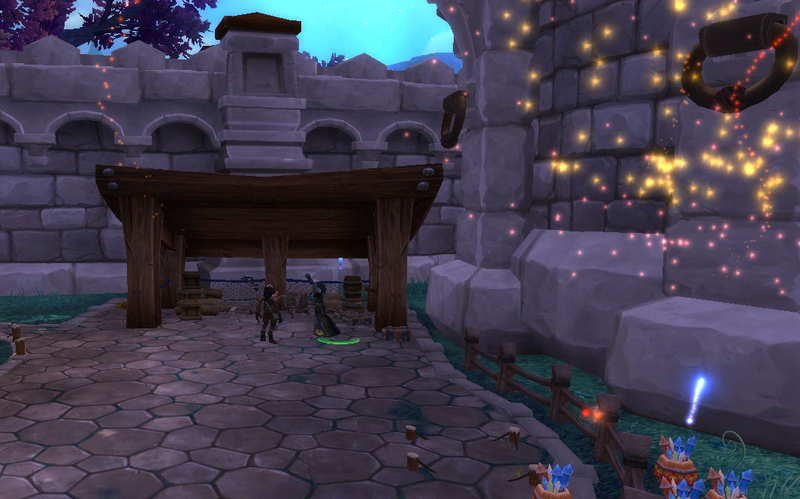 Central to those new battles is the Menagerie, a building located in your Garrison. The unfortunate part is that you have a considerable amount of building & questing to do in order to access your Menagerie. 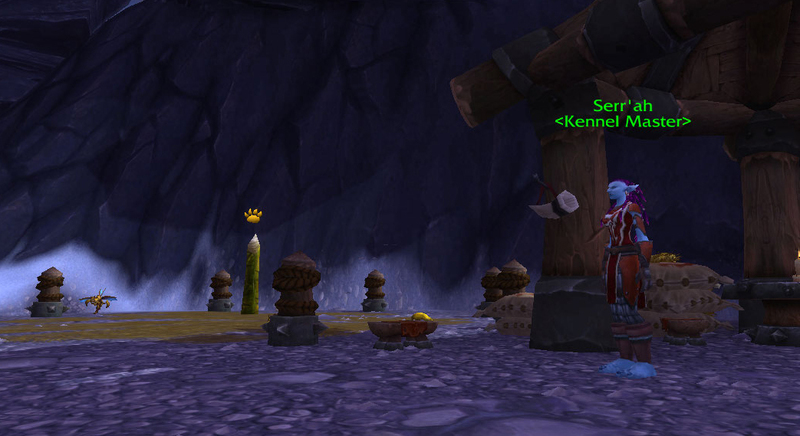 It will only open after your Garrison is level 3 (which by itself requires level 100 and a lot of both garrison Materials and gold), and then you have to do an additional, pet-centric quest in order to fully open it. If you don’t unlock the Menagerie, the NPC will still provide stable master services & allow you to trade in your Pet Charms (a new currency acquired by doing Draenor PVE encounters) for bandages, rarity & level upgrade stones, etc. The crux of this unlocking quest is that there are a few pests you have to deal with around your garrison before your pet master will allow you to open the Menagerie in full. 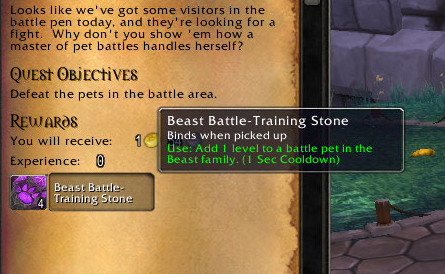 As far as I can tell there are no prerequisites to this quest other than a level 3 garrison, meaning you can attempt this whether you have 6 battle pets or 600. 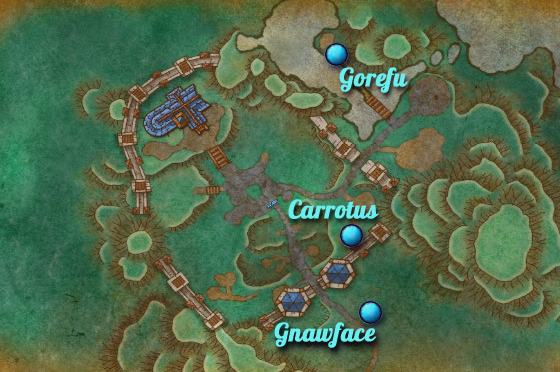 Elemental Carrotus Maximus, aquatic Gorefu, and critter Gnawface inhabit your herbalism garden, your fishing hut, and some random other object, respectively. 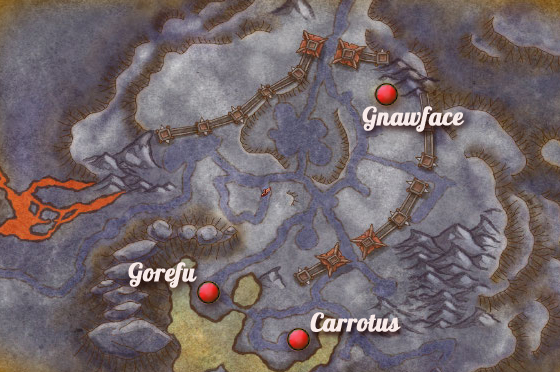 Hordeside, Gnawface is very close to a stump so you’ll want to face to the side & away from it or else you’ll get that ‘uneven terrain’ error message. Alliance-side he’s by a big campfire just outside the front gate. Gnawface uses a lot of strong Critter DPS and the Darkness weather effect to discourage healing. For Gorefu, I used pretty much the same strat I used for Dos-Ryga: lots of birds. He has Feed, so a team featuring a Crow or Raven with Darkness is a good bet too. Carrotus Maximus is quite unique, and kind of fun, because he has both Ironbark, a very strong shield with a damage component he can spam, and Aged Yolk, which removes all his buffs and debuffs. Meaning, many popular strategies, including anything involving stampedes or Howl Bombs, may work occasionally but are far from a lock. I had good luck using frogs with Frog Kiss against him, because they were able to keep themselves up pretty well with a heal, and Frog Kiss adds damage the more times you cast it. Beating all 3 will open your Menagerie for business. This means that you get to display 5 of your favorite pets at random, and you’ll open up the Menagerie rotating daily quest. If you have fewer than 5 pets starred as favorites a random pet will show up in the extra slots. The Menagerie decided I must really like Grinder in addition to the other 4, go figure. At this time, if you don’t complete the opener quest you still have access to the Challenge Post which is the objective of these quests, but you don’t get the special quest reward for completion. This was my very first quest reward. Since then, the Menagerie has shifted to a new currency, Pet Charms. You can use those pet charms to buy some of the new battle-training stones pictured above, as well as rarity upgrade stones, bandaids, pug hats: the usual. The Menagerie is a dedicated slot, meaning that if you don’t battle and don’t have any interest in unlocking it, you can’t demolish it and build a Starbucks. It just sits there sad & unused until you complete the quest to unlock it. You can also upgrade your Menagerie for better pet-related perks. 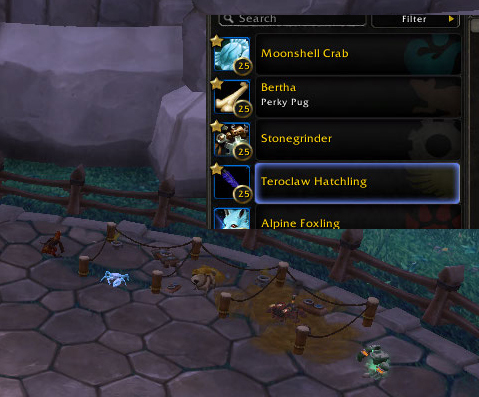 A level 2 Menagerie gives you access to a better trap with a higher chance per tame, additional ‘favorite’ pets roaming around your Garrison, and reduces the recharge time on your Revive Pets spell. The level 3 Menagerie gives you access to an additional daily pet challenge with a chance to win a number of unique new pets. You have to win 150 pet battles in Draenor in order to unlock the level 3 upgrade. Luckily, the new pets obtained from the level 3 Menagerie are also able to be caged & traded, so if you don’t feel like grinding it out you still have options. Now if you’ll excuse me, I have a stick to chase. This entry was posted in Uncategorized on July 27, 2014 by Liopleurodon. Have you found any info on how to acquire the pets which are listed as being gotten from ‘Mastering the Menagerie’? Wowhead shows as being from a bag but the menagerie daily and the Draenor tamers gives charms rather than a bag. When you build your lvl 3 Menagerie, it unlocks an additional quest, Mastering The Menagerie, which gives a bag for completion. I have played wow for years, but I recently started battle pets and it has given my gaming a new lease of life!